The end of the week is often a time of reflection. More often than not this is accompanied by a sense of amazement as I seem to have spent my days here, there, and everywhere, and yet things were accomplished. In seven days, one short week, I drove a few hundred miles on various Route 66 related adventures, met with some of the most fascinating people, attended several relatively productive meetings, acquired a layout designer for the self publishing endeavor (thank you Anne Slanina), negotiated the contract for revising Backroads of Arizona, added a few more appearances to the schedule, and provided a bit of assistance to the folks organizing the Route 66 Association of Kingman. 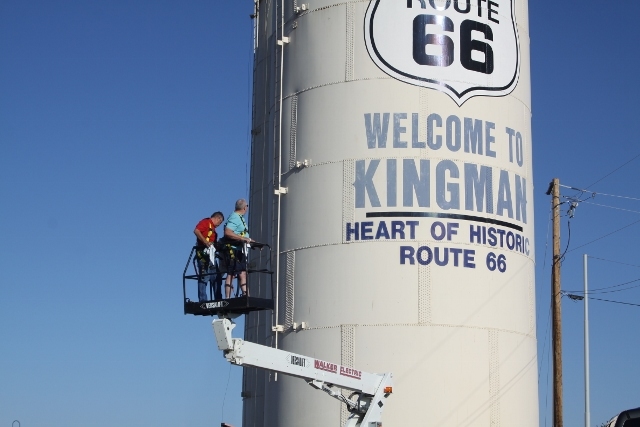 The Route 66 Association of Kingman has its origins in the establishment of still born organization in 1994. The goal at that time was to assist in the development of the Route 66 corridor as a catalyst for transforming Kingman into a destination. That goal remains the same. To that has been added a loftier vision; promoting “160 Miles of Smiles” between Topock and the Route 66/I-40 junction east of Seligman with Kingman at its center. The attorney is still working on details and formalities as well as the establishment of the organization as a 501c3. The board of directors and overall structure has yet to be finalized. Still, the core of association organizers is taking the proverbial bull by the horns. First, there was the long overdue clean up on the corner of Fourth Street and Andy Devine Avenue. Yesterday the task was refreshing the logos on the cities landmark water towers, a throwback to the era of steam engines on the railroad. Last years Route 66 International Festival seems to have ignited a simmering revival. Kingman is about to become a destination instead of a stop on the way to some place else. The “160 Miles of Smiles” promotional campaign sharpens that focus. Kingman is honestly at the very center of an astounding vacation paradise. However, to a large degree only a few people are aware of it. Consider the Grand Canyon Caverns Resort, our latest sponsor. 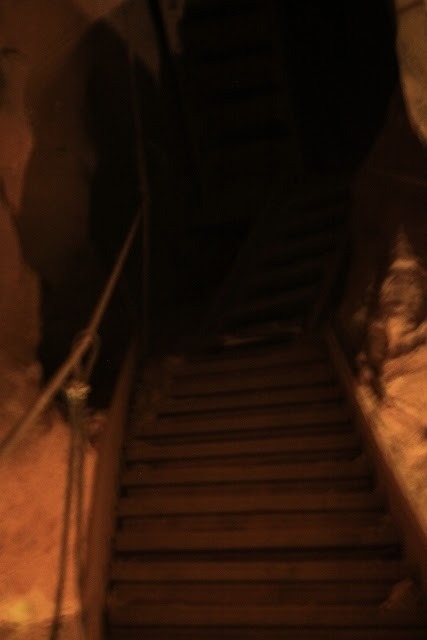 On last weeks expedition I was privileged with the opportunity to explore the access structures built in the caverns during the 1930’s long before installation of the elevator. Did you know that the wood for the stairs and the swinging bridge were originally forms used in the construction of Hoover Dam? Did you know there are still traces of concrete on the wood? Today the caverns is undergoing a stunning transformation that makes it a near perfect blending of Route 66 time capsule and attraction for a new generation. In addition to the caverns themselves, soon to be expanded resultant of the discovery of additional deeper levels, there is also an award winning RV park, a miniature golf course, a riding stables with trail rides, two restaurants, a lounge, and a motel currently undergoing a full renovation. Mountain biking or hiking to stunning locations where a one eyed blind man would have trouble taking a bad photo, no problem. 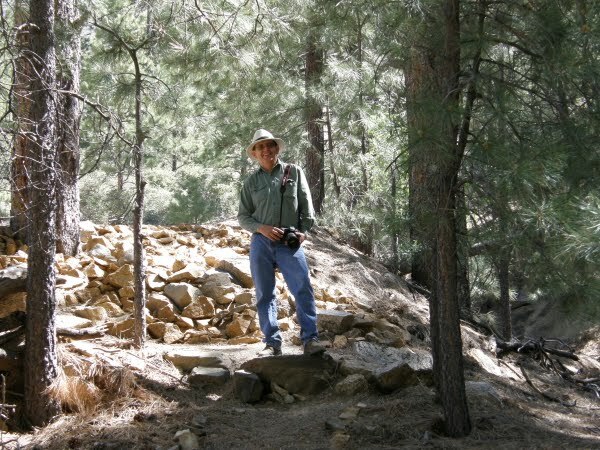 Pine forested Hualapai Mountain Park is laced with trails. There is also the extensive trail system in the foothills of the Cerbat Mountains near Beale Springs and the site of historic Fort Beale. Museums, yep we have those two. These include an award winning Route 66 museum and the world’s first electric vehicle museum. Meanwhile, as Kingman transforms into your destination for 160 miles of smiles, my schedule calls for me to be here, there, and everywhere. Next week there are several meetings related to the transformation of Kingman, my adopted home town, and a trip to Holbrook for the Route 66 Festival. The following week is a meeting of the Route 66: The Road Ahead initiative and an eagerly anticipated dinner with Greg Hasman. The following week its off to San Bernardino for their big event that will center on the Great Race. Boredom and Route 66 just don’t seem compatible. Come, join me for the adventure.